Nothing says summer like enjoying a crisp, unoaked wine on the deck. We're delighted to release our 2017 Unoaked Chardonnay just in time for summer, and have paired it with a recipe courtesy of our next door Langley neighbours, Lente Farms. A simple but gourmet version of a classic chowder, it is also a real hit around the farm table for its healthy simplicity. Our Chablis style wine is bright and fresh with classic fragrant Chardonnay notes of sweet citrus and Gala apple. A bright and lively single vineyard wine from the south Okanagan, this vintage is crafted with grapes solely from Hidden Terrace Vineyard, situated on a plateau 330 feet above the Okanagan River, close to McIntyre Bluff. The site’s somewhat higher altitude delivers a slightly cooler growing environment for beautifully balanced fruit. 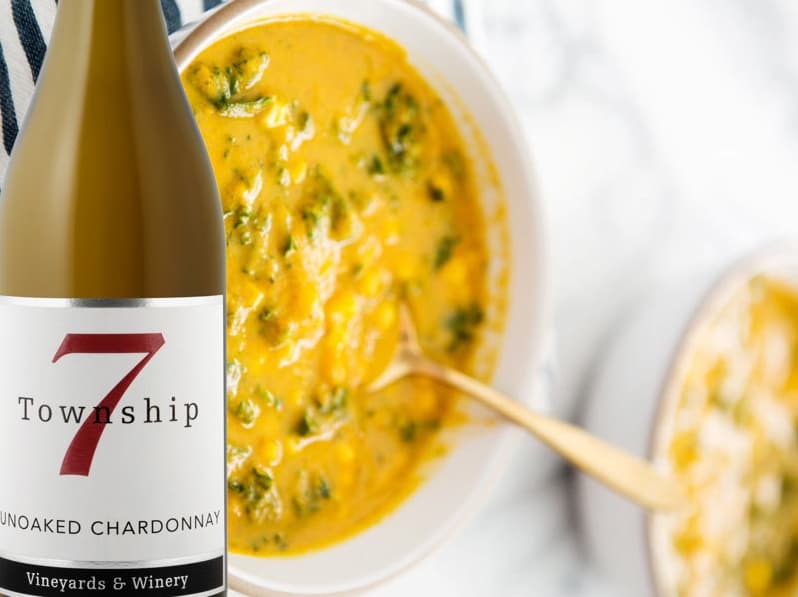 Dry and crisp, this refreshing wine is the perfect accompaniment to the rich creaminess of this deliciously satisfying soup. potatoes, salt, pepper, cinnamon and sauté 1 min. Add vegetable broth and water, cook until potatoes are easily pierced with a fork. Add leeks and cook 2 min. Puree soup in a blender. Add kale and corn. Cook until kale is softened. Add additional salt and pepper to taste. Serve hot with a crusty baguette.